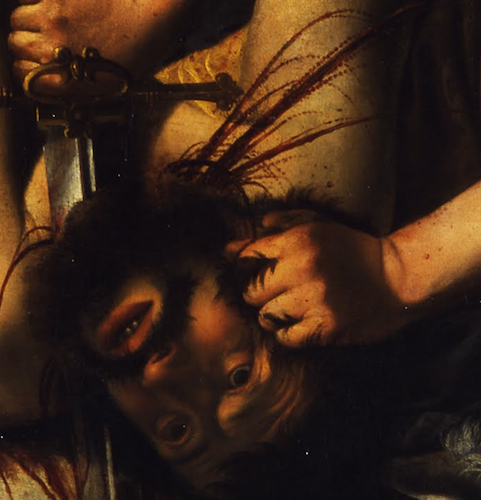 Rivulets of blood run down the white sheets, as Judith, a pious young widow from the Jewish city of Bethulia, beheads Holofernes, general of the Assyrian army that had besieged her city. Moved by the plight of her people and filled with trust in God, Judith took matters into her own hands. She coiffed her hair, donned her finest garments and entered the enemy camp under the pretense of bringing Holofernes information that would ensure his victory. Struck by her beauty, he invited her to dine, planning later to seduce her. As the biblical text recounts, “Holofernes was so enchanted with her that he drank far more wine than he had drunk on any other day in his life” (Judith 12:20). Judith saw her opportunity; with a prayer on her lips and a sword in her hand, she saved her people from destruction. The story of Judith and Holofernes is recounted in the Book of Judith, a 2nd century text deemed apocryphal by the Jewish and Protestant traditions, but included in Catholic editions of the Bible. Like the story of David and Goliath, it was a popular subject of art in the Renaissance and Baroque periods. This particular painting, executed by Artemisia Gentileschi in Florence c. 1620 and now in the Uffizi, is one of the bloodiest and most vivid depictions of the scene, surpassing the version by Caravaggio, arch-realist of Baroque Rome, in its immediacy and shocking realism. Artemisia was certainly familiar with Caravaggio’s painting of the subject; her father Orazio, who was responsible for her artistic training, was Caravaggio’s friend and artistic follower. Caravaggio’s painting inspired, and perhaps even challenged, the young Artemisia. A comparison between the two reveals not only her debt to the older artist, but also a series of pointed modifications that heighten the intensity of the physical struggle, the quantity of blood spilled, and the physical and psychological strength of Judith and her maidservant, Abra. In Artemisia’s painting (below, right) the bloody sheets are in the immediate foreground, close to the viewer’s space. Holofernes’s muscular body projects dynamically into the depicted space as bold areas of light and dark draw attention to his powerful limbs. And, most importantly, whereas Caravaggio (above, left) pairs his delicate Judith with a haggard attendant who merely looks on, her eyes wide with disbelief, Artemisia depicts two strong, young women working in unison, their sleeves rolled up, their gazes focused, their grips firm. 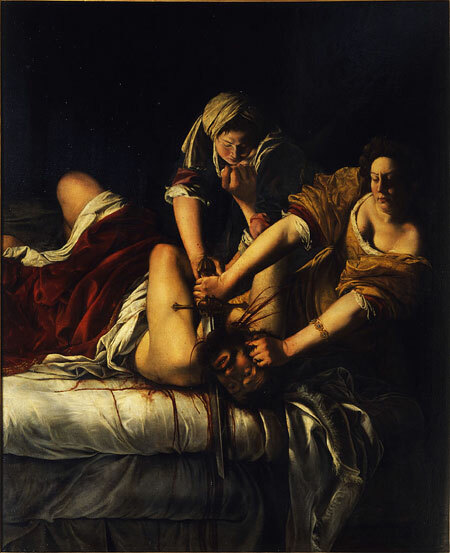 Caravaggio’s Judith gracefully recoils from her gruesome task; Artemisia’s Judith does not flinch. Instead, she braces herself on the bed, as she presses Holofernes’s head down with one hand and pulls a large sword through his neck with the other. The creases at her wrists clearly show the physical strength required. Holofernes struggles in vain, the thrust of his arms countered by the more forceful movement of Abra, Judith’s accomplice in this grisly act. The Uffizi Judith Slaying Holofernes is Artemisia’s second telling of this narrative. The first, executed in Rome c. 1611-12 and now in the Capodimonte Museum in Naples (below, left), introduced the dynamic composition centered on the thrust and counter thrust of extended limbs. Artemisia refined the composition in the second (Uffizi) version. Small but significant adjustments reveal her growth in technical skill, her awareness of the local Florentine taste for sumptuous fabrics, and her thoughtful consideration of the expressive potential of each detail. Awkward passages of anatomy and proportion (such as Holofernes’ head) have been corrected, the colors and textures of the fabrics are now richer (notice the red velvet draped over Holofernes and the golden damask of Artemisia’s Judith’s dress), and Judith’s hair is more elaborately curled, in keeping with the biblical text’s emphasis on her self-adornment. Most striking, however, is the portrayal of the blood. The Capodimonte version (above, left) omits the blood that violently spurts from the neck of Holofernes. Like Caravaggio’s, the Uffizi painting places particular emphasis on this detail, and does so with even greater realism. Framed by Judith’s arms, jets of blood now arc and descend in droplets that bespeckle her arms and dress. The pattern described by the spurting blood suggests Artemisia may have been familiar with her friend Galileo Galilei’s research on parabolic trajectories. Artemisia also modified the sword in the Uffizi version. The sword, here longer and held more vertically, prominently marks the painting’s central axis which extends from Abra’s arm to the blood that runs down the edge of the bed. This powerful visual axis reinforces the strength of the women and the violence of the deed. It is no accident that Judith’s sword-clenching fist is at the very center of the composition; imbued with divine strength, this widow’s hand is now the hand of God protecting the Israelites from their enemies. Artemisia’s unique portrayal of Judith and Abra has prompted scholars to argue that Artemisia identified with the protagonist of the story in a way her male counterparts did not. This association stems not only from their shared gender, but also from Artemisia’s own traumatic experience. Artemisia was raped at the age of 17 by the artist Agostino Tassi, a close friend of her father. When Tassi failed to marry her, as the social dictates of the time demanded, her father sought recourse in court. During the trial, Artemisia describes her struggle against Tassi and her attempt to attack him with a knife. She also recalls the sense of betrayal she felt when she realized her female chaperone had colluded with Tassi and arranged to leave the two alone. The first version of Judith Slaying Holofernes dates to this difficult period in the artist’s life. The memory of this event likely colored Artemisia’s engagement with the story of Judith. Especially significant is Artemisia’s portrayal of Abra as youthful, strong and fully engaged in the assisting Judith, in striking contrast to the chaperone who purposefully abandoned Artemisia in her hour of need. In the Uffizi painting Artemisia adds a small detail that supports her identification with Judith. 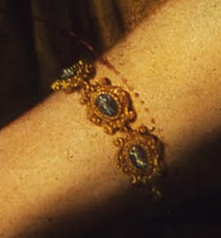 One of the cameos on Judith’s bracelet appears to depict Artemis, the ancient goddess of both chastity and the hunt. While the story of Judith likely held personal significance for Artemisia, it is important to note its broader cultural valence. The story of Judith was especially popular in the Baroque period, not only in the visual arts but also in literature, theater, and music. 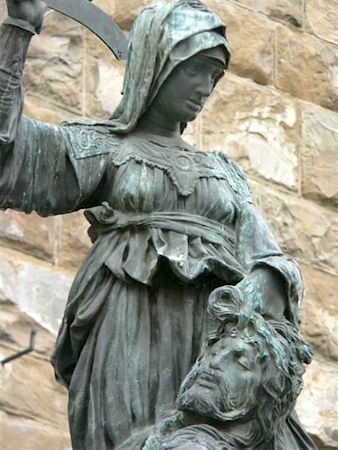 An example of the victory of virtue over vice, of God’s protection of his chosen people from their enemies, Judith was also seen as an Old Testament antetype of the Virgin Mary and, by extension, as a symbol of the Church. This association partly explains the increase in portrayals of Judith in late 16th through the 17th centuries, when the Catholic Church was engaged in conflicts with both the Protestants and the Ottoman Turks, whose eastern origins facilitated their identification with Holofernes. Artemisia and her contemporaries capitalized on this popularity, frequently portraying not only the moment of the beheading itself, but also the moment right after it, when Judith and her maidservant escape from the enemy camp. The dramatic potential of the story made it as ideal subject for the powerful theatricality of Baroque art. The Uffizi Judith was likely either commissioned by or gifted to the Medici, Florence’s ruling family, the same family that commissioned Donatello’s famous bronze sculpture of Judith and Holofernes in the late 15th century (left). 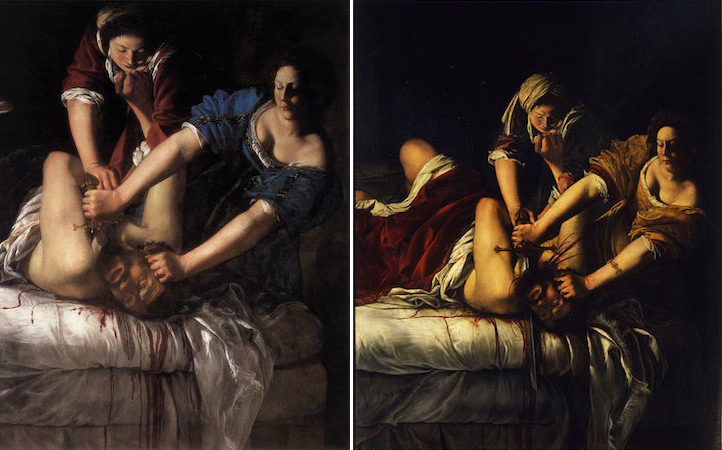 Artemisia Gentileschi was clearly proud of the Uffizi Judith Slaying Holofernes, signing it in the lower right corner. In it she demonstrated her mastery of the language of Baroque realism, exploiting its emphasis on proximity to the picture plane, strong chiaroscuro, and realistic details to create an especially potent depiction of the story’s dramatic climax. The bold immediacy of this finely-tuned composition succeeded all too well, for in the late 18th century, disgusted by the horror of the scene, the Medici duchess banished this masterpiece to a dark corner of the Uffizi, where it remained until the late twentieth century. To this day, it strikes its viewers with both revulsion and awe at the skill of the artist who so convincingly transformed paint into blood. Cite this page as: Dr. Esperança Camara, "Artemisia Gentileschi, Judith Slaying Holofernes," in Smarthistory, July 19, 2015, accessed April 24, 2019, https://smarthistory.org/gentileschi-judith-slaying-holofernes/.